Bobcat Co. introduced compact excavators to the U.S. market in 1986. Today it continues to be one of the few manufacturers building compact excavators in the United States. In 2017, Bobcat introduced its newest compact excavator generation — the all-new R-Series. R-Series excavators build on the success of the popular M-Series generation, providing a boost to operator productivity and comfort, as well as machine uptime protection. The first two R-Series excavators were the E32 and E35 in the popular 3- to 4-ton size class. In February 2018, Bobcat launched the new R-Series E85 excavator. Additional R-Series excavators will be introduced later. 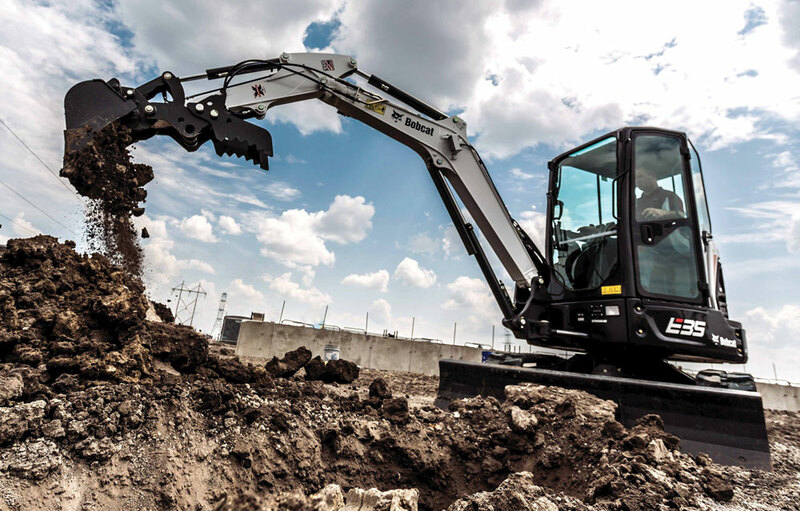 R-Series excavators feature a bold, distinct design. A new dual-flange track roller system was added to provide up to 15 percent increase in lift capacity for improved performance when working over the side of the machine. Operators will also experience improved ride quality, high-quality finish and a redesigned cab. Bobcat offers 11 excavators (the E35 has two variants) to match different operating conditions and worksite needs — five conventional tail swing models, five with zero tail swing and one with minimal tail swing. 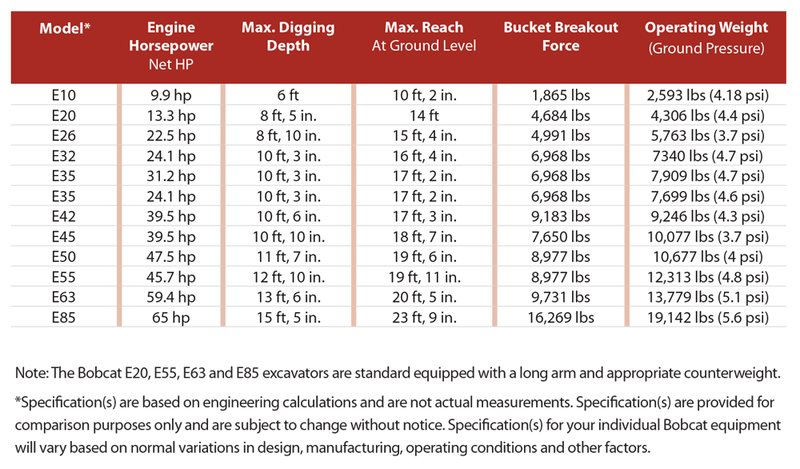 The Bobcat compact excavator lineup spans from the ultra-compact E10 to the 65.9-hp E85. Bobcat compact excavator dig depths range from 6 to 15.5 ft with a standard excavator arm, and a long-arm option is available on many models. A unique feature of five Bobcat compact excavators is an extendable-arm option that allows the use of a hydraulic clamp in the extended position. The option provides operators with up to 30 in. of additional reach when fully extended, giving them more reach, dig depth and dump height without having to purchase a larger machine such as a tractor loader backhoe. The optional deluxe instrument panel has a multi-language, full-color display, providing a quick visual of function and machine vitals. The panel’s home screen displays the fuel level, coolant temperature, day, time and engine rpm. Operators can select auxiliary hydraulic flow rates from the panel for more efficient attachment operation. R-Series and M-Series compact excavators feature auto-shift travel, which boosts the machine’s productivity by shifting the machine in and out of high range automatically, and the auto-idle feature, which can be enabled at the operator’s discretion and automatically causes the engine to return to idle if the excavator’s functions are not used for approximately four seconds, saving fuel and reducing sound levels. Learn more about Bobcat here.